A sanctuary of rest and relaxation on more than 1500 square meters. Slip into your bathrobe in the hotel room and take the lift directly into our bathing and sauna area. As a wellness hotel in Baden-Wurttemberg we have complied with the strict criteria and the classification of Wellness Stars Hotels and have been awarded with 4 stars. Read more on: Wellness Stars Baden Württemberg, or on selected spa hotels. 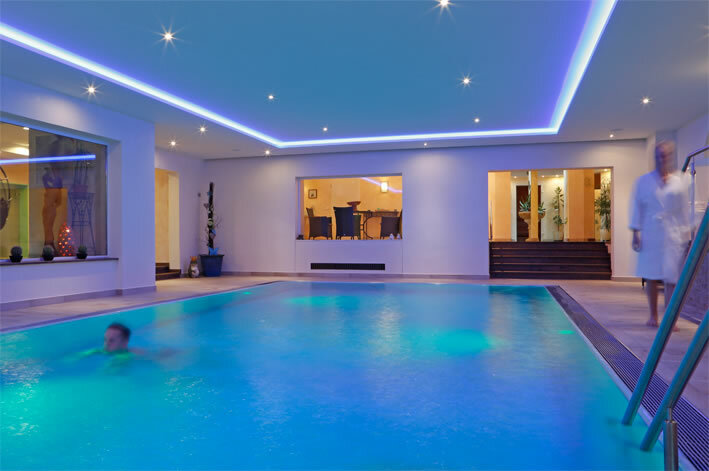 In the oasis of calm “Eichelbergquelle” you can expect a 29 – 30 degrees warm, five by ten meters indoor pool. 4 different saunas, 2 steam baths and a tepidarium. All these bathing facilities invite you to sweat and relax, including a outdoor plunge pool and a bucket shower, which provide for the necessary cooling down. Even as a non-hotel guest, you can use our wellness area daily from 2 pm to 8 pm. Prices per person: up to 4 hours 22,50 Euro, whole afternoon 26,00 Euro. Towels and bathrobe are available for a fee (8,00 Euro). – Treatment rooms for cosmetics and massages.